Dan Devine wrote the story, I added and edited, and together we're posting this story as a free download (all e-formats available at Smashwords). 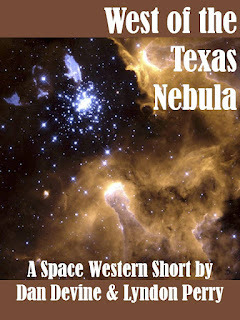 It originally appeared, and can still be read online, at SpaceWesterns.com in 2008. Dan Devine is a scientist by day and an aspiring science fiction author by night, though he'll write any genre that pops into his head. He has had short stories published online in Dark Fire, Afterburn SF, Crime and Suspense, Flash Tales, and many other magazines. His SF novels, The Cull Chronicles (Books 1 and 2), feature reluctant hero Jason Cull and are available at Writers Exchange Ebooks. More news from Dan as well as a list of his stories can be found on his website. Just read the story and gave it a 5-star review. Great stuff!